5. Looking for Hosts for REALITY - MAGIC SERIES - Did you apply? 4. Under new management - Deceptively deceptive. 3. Who's where April 2015 - Don't forget to add yourself next month! 2. Thirty seconds with Chris Mayhew - The videographer speaks. 1. Browser's Magic Bash 2015 recap - What a great day! Can't wait for next year's! A friendly reminder that this Saturday, May 2 from 2:30pm to 5:30pm is our next (free) Magic Club meeting. All interested in talking magic are welcome. For those of you who missed it, Jeff's got a wonderful collection of photos from the Browser's Magic Bash 2015 up on his Facebook page. Earlier this month, I published the post "Under new management." It is a surprisingly well read post. As it stands, it is still the third most viewed post this month. It recently came to my attention that not everyone read through to the second last sentence. Let me cut to the chase. April Fool! There is no change in management happening under this banner. However, there is a kernel of truth to the idea that the sweat equity to income ratio is not ideal. To that end, during the month of May I will be offering 40% discount on the listed price of any one year advertising package. More on that next month. James Harrison, a veteran of the Barrie busking scene, also auditioned. Known as Canada’s Pickpocket Magician, Harrison simply picks a spot, sets up his table and starts talking to people as they pass by. “Magic isn’t just for kids,” said the full-time magician who does parties and table-side magic at some Barrie restaurants. Sketchy Magic, Phil Pivnick and Jason Palter at "Magic Tonight"
Magician Ben-Zion Train will amaze with feats of grand illusion and Barbara Rusch will entertain with stories of master magician Harry Houdini, the quintessential Jewish immigrant. Artefacts once belonging to Houdini will also be on display. On Saturday, May 2, Canada’s top illusionist Ted Outerbridge along with his talented wife Marion will bring an amazing magic and levitation show, Outerbridge Clockwork Mysteries, to the Brockville Arts Centre. During a brief visit to the city last week, Ted took to his signature levitation act with Marion three feet off the ground at Blockhouse Island, in front of a passing freighter, John B. Aird. As many of you are aware, I live-Tweeted and live-blogged the first annual Browser's Magic Bash last Sunday. In this post I've consolidated (and edited) the blog posts and Tweets, and included many of your Tweets tagged with #BrowsersBash2015 . (For the complete list of Tweets and photos check out this Twitter link to #BrowsersBash2015 ) It's a very long post. Click "read more" below to view it. Thanks for joining in. Magicana is pleased to announce on behalf of the Slaight Family Foundation the creation of the Allan Slaight Awards to recognize oustanding achievement in the pursuit of the impossible. Initiated by the Slaight Family Foundation to honour Canadian media mogul and philanthropist Allan Slaight, and his lifelong passion for and contribution to magic, Magicana will distribute, on behalf of the Slaight Family Foundation, $250,000 over five years to recognize excellence in magic. Jason, Glenn, Keith, Greydon, Chris and Chris at "Magic Tonight"
This is the last in my baker's dozen of "Thirty seconds with ..." interviews, so called because I approached the interviewees at Sorcerers Safari Magic and Performance Arts Camp last summer with the idea that I would interview them for 30 seconds. It didn't always work that way. Professional actor and magician Steve Valentine was born in Scotland and currently resides in LA. Love and happiness are the things that come to his mind when he thinks of Canada; his wife, Inna, is originally from Toronto. Steve met Magic Mike Segal at a chance encounter at The Browser's Den of Magic. After hearing Mike talk about Sorcerers Safari Magic Camp, Steve said that he'd "like to help out if he could in anyway." And so, Steve attended magic camp last summer. Steve would rather watch Dr. Who than either Star Wars or Star Trek. - Steve's life motto: "Always do everything you want and love to do, to live a fulfilling life. Don't let anyone tell you otherwise." - Steve was named the Magic Castle's Close-up Magician of the Year two years in a row. - You may have seen Steve in on TV on shows such as Crossing Jordan, House, NCIS, and The Big Bang Theory. Here's what Steve had to say about Sorcerers Safari: "It's fun! It's a bunch of magic nerds getting together." He also expressed a little bit of jealousy. Like many of the adults who have been to magic camp, Steve wishes something like this was available to him in his youth. Steve's first memory of magic has him at six years of age in a playground in England and involves a vanishing knot. It was around that time that he also learned an important show business reality – if there's no publicity, no one will show up. It's Steve's observation that the kids today are learning at an exponential rate given the easy availability of magic videos to consume. He hopes these kids will also make a point of exposing themselves to more of the history of the craft and rounding themselves out as individuals. Steve thinks that we're at a great place in magic, in that there's a new generation of audiences available who are not jaded by the "old shtick." He's especially happy that audiences are really accepting and enjoying close-up magic. Steve's advice for aspiring magicians: "Learn and read as much as you can – old books especially (fewer people know about this stuff)." Interview: Zack Mirza about his show "Illusions of Grandeur"
Zack Mirza's show "Illusions of Grandeur" airs Tuesdays at 9:30 p.m. ET on OLN. I'm excited to have to guest post at TV, eh? where I interview Zack about his show. Thank you for the opportunity Diane! I was very impressed to see that you include historical footage like clips from Dai Vernon’s “The Spirit of Magic.” I understand you’re going to be delving into some magic history throughout the other episodes. How important do you think it is for magicians to study the history of their craft? Prior to the show I knew a little bit about the history of magic but going through the whole experience I got exposed to so much more. I can’t express how important it is for up and coming magicians, and magicians out there in general, for them to learn about the history of magic. We’re basically standing on the shoulders of giants. Everything that they’ve done is pretty much the ground work for what magicians are today. There’s so much respect. There’s so much wisdom that you can pull from anyone in the past. As soon as you get to learn a little bit about the history it just makes it that much more special. Dean Gunnarson's "Escape or Die!" Dean Gunnarson's show "Escape or Die!" starts Tuesday April the 14th at 9pm on OLN. If all goes according to plan, all live-blogging posts from #BrowsersBash2015 will appear under this post. The most recent update will be immediately after this post. Check back often for updates! This post is part of a series of live-blogged entries. For your convenience, the entries have been consolidated into a single post at "Browser's Magic Bash 2015 recap." Individual jam-sessions happening directly after the show! The Browser's Magic Bash tradition has officially begun and is off to a great start! Amazing stage show with David Acer, Haim Goldenberg, Greg Frewin, Nathan Kranzo, John Park and Richard Sanders! Jeff just won the first ever Head Basher award for his contributions to the magic community! Two people worked tirelessly to make the #BrowsersBash2015 come together into this wonderful event. Both are wickedly smart. Both are very creative. Both are very hard workers. And both are very good people. Lee Asher and John Talbot ...without them there would be no Browser's Magic Bash. Thank you Lee and John! They were both presented with sweater vests! - all the staff here at the MonteCassino for treating us like family. Cheers to the office, engineering, hotel, and kitchen staff. - people who helped transform the Bash into something special: Annie Pinsky, Mike Segal, James Allen, Ben Train, Chris Mayhew, Marvin & Shawna York, Nicole Lee, John Michalson, Stephanie Kline, Roxanne Talbot, and Christina Asher. Wow! Alexander Pappas came here all the way from Switzerland and Jo Deng came from Changsha, China. Kudos to Steven Kline Productions for all the behind the scenes work and to Luiz Castro for helping! Browser's Magic Bash Food Drive had two tables full of cans & dried goods contributed. A week tomorrow, it's going to the Toronto Food Bank on behalf of the local magic community. Lanyards generously donated by Chad Juros of the Spread The Magic Foundation. Chad is a leukemia survivor with an inspirational story. Spread the Magic spreads hope and inspiration to children battling cancer through the power of magic. Mahdi Gilbert spent a few months at Conjuring Arts Research Center in New York helping to transcribe historical magic texts into a digital format. Called the Conjuring Arts Research Center, and told them you were speaking at the Bash. They are very proud of you, just like we are, and they wanted to celebrate with us, too. On behalf of the Conjuring Arts Research Center, in honor of Mahdi Gilbert, and in celebration of the Browser's Magic Bash, everyone here has been gifted a digital copy of the project he deemed your favourite - the entire Tarbell Course set! Thank you Conjuring Arts Research Center, and thank you Mahdi! Another recipient of the Len Cooper Memorial award, Mahdi Gilbert takes the stage. Chris Westfall up to talk about improvisational magic. Eric Leclerc asking audience member not to freak out. Jeff Hinchliffe is back in the world of magic! Lunch is being served. Pizza and sandwiches. Nom, nom, nom. Jeff's uncle, (his dad's older brother) flew in from Montreal to spend some times with us today in Jeff's dad's honour. A rubber chicken for Dr. Uncle Jerry! Jeff also recognized Joan Caesar, the founder and past president of the Canadian Association of Magicians and also the past International President of the IBM! Bernice Cooper and her son were here too. Fabulous! Richard Sanders entertaining the crowd. On stage 146 year old Doc Wuthergloom. Welcoming Wij Siva on stage! On stage Nathan Kranzo sharing childhood Applebee's experience. David Acer, 'Official #BrowsersBash2015 Emcee of the Day' has the stage. Jeff is still welcoming everyone to the very first #BrowsersBash2015 ! We're here safe and sound. The room is almost ready and the attendees are getting registered. Big display table of food drive contribution so far. Dealer's table is well stocked. One minute warning just called. Rise and shine for #BrowsersBash2015 ! As many of you know, tomorrow is the "Browser's Bash," an all day convention hosted by the Browser's Den of Magic. It was announced on the Browser's Den Twitter feed that the event is a complete sell out! The #BrowsersBash2015 is OFFICIALLY SOLD OUT (for the 2nd time). Over 250 people will be in attendance tomorrow! Will you be one of them? I'm one of the lucky ones attending and plan to be doing some combination of live-Tweeting and live-blogging of the event. Apologies in advance for clogging your feeds. To follow my Twitter account, you can use the web or use the Twitter widget on the right side of this page, under the "Selected Anniversaries" feature. If you're at the event and Tweeting, I encourage you to add the hashtag "#BrowsersBash2015" to your Tweets. I've added a feature just under the header of this page, which collects and posts all Tweets tagged in this fashion. I look forward to seeing many of you tomorrow! It's interesting to read the comment section of the post. How lovely to see that people can be passionate about their favourite magician. Doubly so that there are so many talented magicians in Toronto from which to choose! What do you think? Did PO Karim get the top five right? The top magicians and mentalists in Toronto are amongst the best in the world, though skeptics may not be aware of their existence. These masters of magic are sought after entertainers wowing audiences from TV and stage to corporate functions and special events. Whether they're using elaborate theatrics or a deck of cards, their specially honed skills can have you believing in the impossible. On with the show - here are my picks for the top magicians in Toronto. The Secrets of Success Project is a collection of inspiring and motivating Niagara success stories. Anthony Lindan, whose 15 years old son is on the Autism Spectrum, created the Project as a third party fundraising initiative to raise both money and awareness for Autism. Anthony interviewed some of the most interesting people in Niagara - world class athletes, radio personalities, business people, entertainers and entrepreneurs - about their success. The interviews offer powerful tips and insights about becoming more successful both personally and professionally. The interviews are online at http://secretsofsuccessproject.com/ and visitors are encouraged to listen to as many as they like and make a ‘pay what you can’ donation. All net proceeds from the Project will go the Autism Ontario Niagara Region Chapter. Amazing is the only way to describe Greg Frewin’s career and his passion for amazing and entertaining his audiences. Greg is currently Canada’s most accomplished and successful magician. He has performed on every major stage in the world, on numerous TV specials and has won every magic award and honor offered. For the past 10 years Greg has performed about 275 dates a year in his own theatre – The Greg Frewin Theatre – in Niagara Falls, ON. Greg shares the real secrets that have brought him incredible success both on and off the stage. Read more, listen to the interview and make a donation to the Autism Ontario Niagara Region Chapter. New, reality MAGIC SERIES driven by 2 actual magician/illusionists, who go undercover as tour guides of authentic haunted locations, creating mind-boggling, organic illusions each tour to unsuspecting crowds of tourists. [MAGICIAN/ILLUSIONIST 'HOSTS' X 2 (MALE)] UNION or Non-Union. 2 experienced magician/illusionists, capable of creating organic illusions of conjured paranormal phenomenon. Must be highly skilled in a variety of forms of magic including but not limited to large illusions, escapology, close-up magic, mentalism, and pickpocket. An interest in the paranormal is a plus as well as a comedy background. Highly experienced MAGICIAN/ILLUSIONISTS. Ability to collaborate with a team of magician/illusionists. Strong improvisational skills. Strong interaction skills. Comedy/Acting background an asset. An interest in the paranormal. Must be CANADIAN. 3. SELF-TAPE – 2-3 minutes - Chatting directly to camera, as your outgoing self, tell us briefly about your Magician/Illusionist experience, your interest in the paranormal, and an example of a mind-boggling paranormal illusion you would create. ***Please ensure enough light for self-tapes. 5. Email materials through a file/video sharing site, such as an unregistered youtube link, or via WETRANSFER OR HIGHTAIL, WITH EMAIL LINK TO: mirjam@vanderwerfftalent.com by Wednesday April 22, 2015. With thanks to Lisa Close for sending this in. Post by Peter Mennie - Magician VIP Entertainer. There's a high probability that I'm going to get a chance to interview Zack Mirza about his upcoming docu-series, "Illusions of Grandeur." If you have questions you'd like me to ask, e-mail me or leave them in the comment form below. A short note that on this Saturday, April 4th our monthly free Magic Club takes place at Browser's Den from 2:30pm until 5:00pm. Thank you to our April 2015 sponsors! 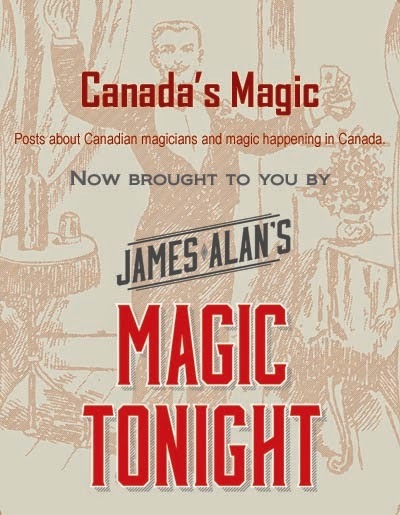 It is with mixed emotions that I announce, effective immediately, James Alan is in charge of Canada's Magic. As many of you know, I started this site over 4 years ago and have since tried to make a go at making it financially viable. I remain grateful to my sponsors past and present (Doug Cuff, Ryan Pilling, Clive Court, Phil & Evelyn Matlin and Jeff Pinsky) for showing me their support. However, the sweat equity to income ratio remains unfavourable. I have great faith that the site will be in good hands. James did wonders with the Ring 17 social media during his presidency. I understand that he's got many creative plans lined up for the future. (Based on the success of the recent "Thirty seconds with..." interviews, I understand he's lining up some interesting podcasts with mimes). I will be assisting him with transition in the short term. For current sponsors, you have the option of riding out your current contract or contacting me directly to make alternate arrangements. For my long time supporters, I thank you and hope that you show James the same support and encouragement that you've shown me over the years. Before you contact me to find out the unpublishable details, I recommend that you check the date this was posted. Thank you, as always, for your support and understanding.